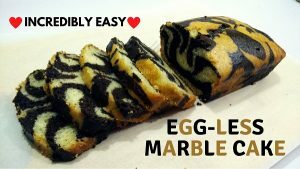 Almost all cake recipes require Egg as a basic ingredient to make soft Cake. 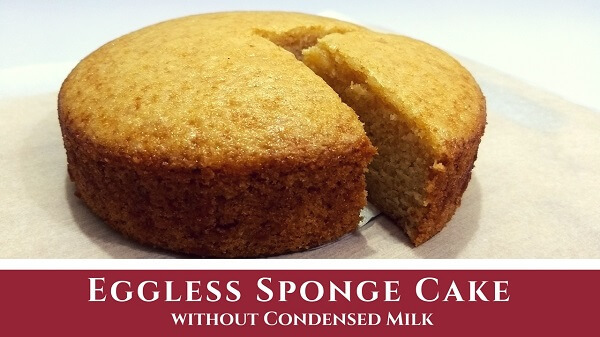 If you follow the strict vegetarian diet, here I am sharing the recipe for Eggless Sponge Cake without Condensed Milk. Instead of Condensed Milk, I have used Curd, Baking Soda and Baking Powder to make it spongy & fluffy. Follow this step-by-step recipe to make Eggless Sponge Cake at home. Add dry ingredients in a bowl; All-Purpose Flour, Powder Sugar, Baking Powder, Baking Soda, mix well. Now, add Oil, Curd and Vanilla Essence, mix well. Finally, add warm water, mix well to prepare the batter. Grease the baking tin and align butter paper at the bottom. Preheat Microwave at 180 degree Celsius for 10 minutes. Bake at 180 degree Celsius on convection mode for 25 – 30 minutes. After removing from the microwave, let it cool down to room temperature. Unmould the cake and cut into pieces. Eggless Sponge Cake is ready to serve. Garnish with Vanilla Cream Frosting or Chocolate Ganache or serve on its own. I have used the 6-inch round baking tin for making the Sponge cake; you can increase the measurement of the ingredients in the same ratio for making large size cake. You can also use Melted Butter instead of Oil. Make sure to use fresh Curd for the recipe.